Like many of you (great comments!) I’ve been playing this week with what words Willie defines the same as I. As suspected, most of the words I have used to communicate with him are verbs (to him), and that appears to be his “default” understanding. He HAS learned however, names for living things, me, Jim, Sushi, my other dogs when they were alive, etc. But all his toys are either “toy” or “ball,” and as I think about it that’s exactly how we used those words for several years. Go “up the hill” and “go to the barn” are effective and impressive cues, but I’d bet a lot of money that he has no idea what I mean by “barn” or “hill.” This weekend we’re going to work on labeling an object (his scorpion, Scorch, a favorite toy that is miraculously in great shape after 2 years) by holding it, throwing it, handing it to him and repeating its name. We’ll even try the “Model-Rival” method that Irene Pepperberg used to teach nouns to Alex, (except Willie won’t have to say the word to get it, but Jim or I will!). Some of the questions that readers have brought up are extremely interesting, for example: how much does breed predisposition matter? What about the first weeks and months of training–how much does our behavior shape how our dogs perceive our words? Why do some dogs have no trouble distinguishing from a large number of objects, and others get frustrated and confused when we try to teach them to do so? the articles on this post is definitely a single of the most efficient substance that i?ve really are available throughout. I truly like your article, I will are available once more to confirm for new posts. Advantageously, the post is really the sweetest on that notable topic. I concur with your conclusions and also will certainly thirstily look forward to your upcoming updates. Saying thanks definitely will not just be enough, for the fantasti c clarity in your writing. I can at once grab your rss feed to stay abreast of any updates. Genuine work and also much success in your business dealings! I thirstily look forward to hearing from you with your examples, and promise to at once grab your rss feed. Just don’t let it get around. « Could you learn 1022 new nouns? I love the photo of Lily and Willie! Are some breeds more prone to toenail problems? I have Irene Pepperberg’s book, but haven’t been able to finish it yet. I look forward to finding out what nouns Willie learns to integrate. I think this is an absolutely fascinating subject! Justus immediately responds to the sound of my removing a tissue from the box. He is obsessed with used tissues and will sit ad infinitum in hopes of being rewarded with one….bleah. My blogs are apparently not that well read as I don’t get such bizarre comments. Thirstily enjoyed those you shared. My dog HATES his boots until it’s time to run in the snow. Then he seems to forget, that is until he doesn’t anymore. He hates his coat, too. Still, invaluable for wet, cold, icy weather. And I think he knows that boots and coat are nouns =-) because when I say them, he runs and hides. Okay, maybe that makes them action verbs. Thanks for your great blogs — they really get me thinking and I love the photographs always. Wow, I gotta start blogging! How edifying it would be to read that something you posted is “the sweetest on that notable topic” (unless of course it’s only you they say these things to Trisha)! 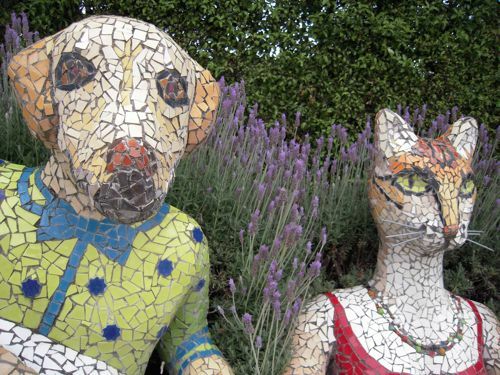 How joyful Willie and Lily look – does Willie understand that the white dog living thing is “Lily”? Lily and Willie, it’s a phonetic ‘snap’. In my multi-dog house it seems as if each of my dogs identifies with a favorite object. For example, Luna my 3 year old Papillon absolutely loves to play laser tag. Yes I know this is a no-no but we don’t play often and its a good way for her to get exercise in the house when its too cold to go outside. If I say “where’s the Kitty Kitty”? she knows exactly what that means and goes to find it. Not sure how it became the “Kitty Kitty”, also known as the Light of Zartha but its entertaining to say. Love your blog, I live in KY now after moving from Blue Mounds almost 5 years ago. Nice to keep up with your stories!! Please keep us posted on Willie’s vocabulary! I was fascinated about the BC on the BBC’s Secret Life of Dogs, and how she could find the right toy not only with the name, but by being shown a replicate, and a two dimensional picture! Funny comments! I wonder if they use a computer translator like Babel fish to get them in English. I get some funny results with that when I try to use it to translate other language websites. I haven’t really tried to get my dogs to label individual toys. They always seem to have a favorite toy and only want to fetch that one if it is available, or if you take that away, they have a second favorite toy. Cinder goes to the extreme of fetching whatever I threw no matter how many more of them are around. She likes to fetch crab apples, and it always seemed like she was searching for a particular one in the high weeds which are filled with crab apples under the trees. So one time I put a mark on the one I was about to throw, and she really did search through the piles with her nose until she found that exact one and brought it back. I got rid of that one, picked another up, marked it, threw it and she went and found the new one- the only one I had touched. It makes me want to get into her head and see why she is so particular. Google Translate just doesn’t do its job as well as it should. The only weird replies my dog gets to his blog are “I loved this entry, come visit my website to find out about declaring bankruptcy” and the like. I have to comment on Willie’s one toy, Scorch, that is still whole. I’m beginning to think that all dogs choose one toy as their special woobie. My guy’s pyramid shaped toy (creatively named “Pyramid” by me) is still whole after 10 years even though he plays with it every day and has to sleep with it at night. Meanwhile, the reindeer he got for Christmas was hoofless after 30 seconds. 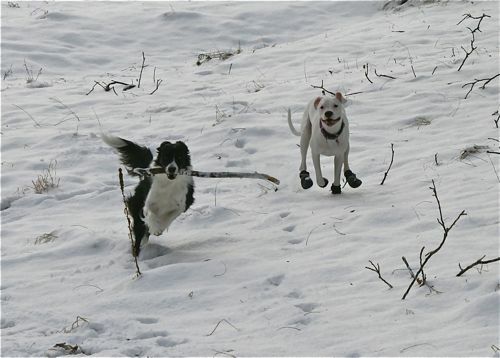 Love the pic of Willie and his friend playing! My younger dog is coming on 4 and while he will still play with other dogs, he prefers sniffing the ground looking for something edible (which to him is a lot of things). I miss the days when he lived to play. My older Corgi thinks of “playing” with other dogs as running after them saying “harf harf harf!” whilst trying to bite them on the behind. Her selection of playmates is therefore mostly some type of retriever, all of whom seem to find this behavior charming. Using a favorite toy to teach the idea that toys have names is exactly what we did with Jack. We spent some time on “Get keys? Where are keys?” until he got them, then I just named a second toy and when he (inevitably) brought me keys, I said “No, those are KEYS’. Get TENNIS BALL” while re-directing him to the new object. Once the light went on in his head, all the rest of the toys that followed were easy, because now he had a concept. I’ll be looking forward to hearing how Willie does. My last dog could differentiate between about a dozen toys. I never stopped to think if it was a verb or noun to him, I just knew when I gave the name he would retrieve the toy from a pile. It was a fun way to keep him mentally stimulated. I’m certainly fascinated by the topic though. I’ve read a number of articles about the study, but haven’t had a chance to read the actual study itself yet. Hopefully this weekend. Keep us posted on Willie. I think breed disposition helps determine how “object-oriented” an individual dog might be, with dogs who are really motivated by and involved in their toys being perhaps more likely to be able to learn names to distinguish them. At least, that’s the conclusion I can draw from comparing the hunt-bred Labrador Retriever I grew up with (who knew without being specifically trained on it which was his (squeaky rubber) “hot dog” and which was his “ball”) and the greyhounds I’ve owned as a grownup, who just don’t care about toys for the most part. That said, I’m pretty sure my current (VERY people-oriented) boy knows the names of certain people who are important in his life. And of course I misread “I can at once grab your rss feed to stay abreast of any updates.” Not sure I want a complete stranger grabbing my anything, thanks! You had best not grab my rss, especially thirstily! Luckily my blog is not all that popular. What a great picture of Willie!! Great picture of Willie and Lily! I’m eager to hear how the vocabulary lessons proceed! @AnneJ Otis does that crabapple trick, too, but with snowballs! We’ll ball up and toss snow clumps to Otis, who will try to catch and eat them. Another skill learned late, catching is not his strong suit…I suppose the fact that we almost never practice doesn’t help, but Otis is laughably bad at it. As a result, he actually catches the softly lobbed snowballs maybe one time in three. When he misses the snowball, which is most of the time, he’ll rootle around until he finds it, plunging his head into drifts, sniffing and dismissing dozens of near-identical clumps until he finds the one that we touched (or what’s left of it) to scarf down. Watching him search for one particular clump of snow amid a landscape blanketed with it has always cracked me up. For the past few weeks I was only getting boring lists of links to medications, it was a bit disheartening…I thought they didn’t care anymore! Not exactly on topic but it sort of goes along since it applies to how a dog’s mind works. I’ve played peek-a-boo games with Ranger where I cover my face/head with a blanket or something and ask him to find Mom. He’ll pull the blanket off so I believed that he had at least some sort of theory of mind but now I’m not so sure. The senior cat rules and when Ranger is sharing a couch with him Ranger is always very careful not to lay on Katzenjammer (especially since the one time he did and Katzenjammer bit him). However, Katzenjammer at 16 is having a bit of hypothermia so often we’ve been covering him with a light weight fleece throw. When Jammers is uncovered Ranger is very careful not to lay on him but as soon as the throw goes on Jammers body becomes invisible and Ranger will drape a paw over it or stretch his tail over it (we’ve been careful not to let him actually lay on Jammers). He doesn’t seem to have any idea that Katzenjammer’s body continues to exist whether covered up or not. It’s so fascinating watching and trying to figure out what they do and do not understand. As for my blog, I think my family are the only ones that read it so no interesting comments. Love the picture of Willie and Lily! I would have loved to comment on the last four topics. Great discussions. I have three PWDs, a nine year old who was my first “show” dog; a almost four year old girl; and a five month old puppy. The girl and puppy are half siblings with the same mom. My oldest dog happily learned anything that I wanted to teach him as his underlying personality is best summed up as “Is there a game on and how soon can I get in it?” And he was my first dog that I “trained” so you all can rest assured that I learned more than he did! When my girl was a brand new puppy, it took her two weeks to learn where the back door was. As she grew up, it took her a year to house-train (potty outside). She has difficulty with distractions and noise, and I suspect thoughts in her own head that make it hard for her to learn things the first time, the second time, or the twenty-third time. However, when we reach the magic repitition number (and only she knows what number that is), she has the concept, and it is locked securely in her brain. She has been a joy and a frustration to train. She and I earned a water title this summer, and I went thinking we were prepared, but not being sure what she would do. She was rock solid in everything that I asked her to do, and nothing kept her from her tasks. Her half brother learned where the back door was in two days. He has had four little errors in house-training. I ask my dogs to sit at the back door before being let outside, and he will sit before his sister. I didn’t teach his sister to sit at the back door until I had three dogs, nor has she had sufficient individual work on sitting at the back door. And she hasn’t figured out that she needs to do it every time I ask. On the other hand, her brother hasn’t had individual work either, and has sits at hte back door as a five month old puppy. Facinating. It is my great fortune to have this comparison in dogs. I am reminded often of your comment, Trish, from the Calling All Pets show, that it all comes down to the individual dog. My 4 year old male BC has been toy crazy since the day we brought him home at 10 weeks. From the start we called each of his toys by a name & he would get which ever we asked for – we did not realize that this was not necessarily typical behavior (but very human of us to have labeled everything!). He now has close to 60 toys – indoor & outdoor & those we keep at my parents – that he will get by name. I have to keep a list since there are so many now. If a toy we request has been hidden, he looks but comes back empty mouthed. He is able to discriminate w/new toys too – I have introduced new toys with old toys & he will bring the new toy I’ve just named even if he has never seen it prior. He also remembers toys he hasn’t seen in months. His awareness of other dogs’s & people’s names is present but seems limited to my name (but not my husband for some reason), Grandma & a handful of neighbor dogs. I also have an 8 month old female BC – doesn’t know the name of any objects but responds to plenty of requests for action behaviors. We will continue to try & get the spark for object recognition. She is interested but not nearly as interested in toys as my older BC. This is off topic, but on my mind. Have you looked at how dog behavior can be a reflection of our mental state? I have an interesting example. I’m working with an undersocialized momma dog who is very choosy about who she is shy with and who she isn’t. I thought she was more comfortable with women than men, becuase she interacted with me the most and my husband is hands of due to allergies with her. But when I took her to an adoption event, she totally surprised me as I watched how she interacted with people. There were cleary men and women that she was comforatble with and others that she backed away from. Thanks for considering a blog on this topic in the future. Terra started her training with me at 8 weeks old, so maybe that mattered for her, seeing as she’s not a typical “smart dog” breed. It could just be that I know more now about training when I started with her than I have with my past dogs. What is the Model-Rival technique? My spaniel mix initially learned to retrieve a toy of her choice with the command “Get your toy” and a gesture in the general direction of the toy(s). Later, I taught her to retrieve her food bowl with the command “Get your bowl”. Unfortunately, the bowl is stored in the same general direction as the toys, and this behavior has partially obscured the “Get your toy” behavior. Now, the command “Get your toy” has a fairly high probability of causing her to return her bowl, making me think that both commands are technically incompletely trained. BTW, the probability that she will return her bowl when told to “Get your toy” increases as it gets closer to dinner time! Gotta brag on my male labrador/australian shepherd mix. He knows the names of all his toys, and will get whichever one I ask for. But that is mostly due to some training; I have always introduced a new toy by name, repeating the name many times while playing with it, and say things like ‘good piggy’. He still has his very favorite toy, a frisbee he has had since he was a few months old (he just turned 9). He remembers where he left it about 90% of the time; the others he needs help with, but seems to know where ‘out in the yard’ is. Now, his sister (littermate) is a different story. He doesn’t let her play with his toys (poor girl winds up chomping on empty plastic soda bottles), and only seems to know three phrases: “hot dog”, “bed time”, and “daddy’s home” (which gets them both into a near-frenzy and running to the front door–unfortunately even if he’s in the same room they are). I have noticed this about verbs being much easier for my service dogs (bouviers) to learn than nouns. I’d assumed it was a “dog thing,” but definitely some dogs seem better at it than others. And then I realized, no, like you with the barn and hill, he learned to GET the phone and to GET the water from the fridge. They were still verbs to him. With each dog, I have made a concerted effort to teach more English. I don’t know if it’s working. I’ve tried to use the name of the toy we’re playing with very consistently since he was a pup, but it’s hard to know if he really knows any of the names, partly because he, er, shreds them to death. Partly, he just doesn’t seem to be as voice/word oriented as my previous dog was. Barnum (my pup in training) exemplifies what you write about dogs being highly tuned in to visual cues. He’s the first dog I’ve had where I have that “reading my mind” feeling, where he knows the cue I’m going to give almost before I do, but teaching voice commands and names, not so much. . . . grin. But yes, like you said, he has learned names for all the people very quickly and thoroughly. Oh, and my spam is always very generic. Your spam is way more interesting than mine. Mine is also often very long messages in the cyrillic alphabet. NO idea why! Here’s a new one — but still not better than yours!